The Atlantic Beach King Mackerel Tournament would like to thank our sponsors, participants, volunteers and supporters for making last year’s tournament such an overwhelming success. 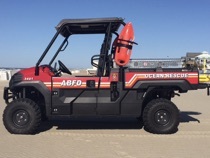 Thanks to you, we exceeded our goals and purchased a much needed beach rescue vehicle for the AB Fire Department. Our 2018 goal is to purchase a $15K piece of lifesaving equipment requested by the Fire Dept known as an AutoPulse Resuscitation System for Automated CPR, manufactured by Zoll Medical. The Atlantic Beach King Mackerel Tournament is a non-profit fundraiser supported entirely by volunteers with the mission of purchasing lifesaving equipment for the AB Fire department. This year we hope to grow the tournament to 100 boats. Our 2018 Tournament will again be a three week tournament to protect participants from inclement weather and hurricanes. We will be a King Mackerel only tournament. From the fishing family to the experienced King Mackerel Fisherman, this tournament will again be a fun and exciting event for everyone. So bring your family and fishing buddies, and join us for this historic tournament. We welcome you. We hope you enjoy all the fun and excitement Atlantic Beach, Carteret County and the Crystal Coast has to offer. All money donated is tax deductible due to the 501(c)(3) status of the Atlantic Beach King Mackerel Tournament, Inc.